Translation is both an art and a science, and it takes more than you might realize to get a correct translation. 1: an expression in the usage of a language that is peculiar to itself, either grammatically (such as no, it wasn’t me) or in having a meaning that cannot be derived from the conjoined meanings of its elements (such as ride herd on for “supervise”). b: the syntactical, grammatical, or structural form peculiar to a language. Idioms are so much a part of our language — of ANY language — that it can be hard for learners or translation seekers to understand that they may not make sense when translated directly into another language. Many pitfalls await for people who try to do their own translations without actually knowing the language into which they’re translating. Assuming that idioms can translate literally across languages is one of the most common. This is what happened with the shirt on the poor fellow in the photo above (His face and his Twitter handle are obscured to save him from embarrassment, as I doubt he’s the originator of this mistake. It’s been going around the internet for quite a while. He looks sad because he’s just learned that his shirt is wrong). Whoever “translated” the words on his shirt assumed that the common American English slogan “Go [sports team]” could be expressed literally in Irish. By now, I probably don’t have to tell you that this is not the case. There are two problems here, and the first (and most fundamental) issue is one of idiom. What the shirt is intended to say is “Go Blue” — a slogan you’ll hear shouted enthusiastically at games by students and alumni of the University of Michigan (whose color is, of course, blue). Irish has a couple of words that mean “go,” depending on context. The one used here is the verb téigh (Yes, I know that nothing on that shirt looks like “téigh.” More on that in a moment). Another common one is imigh. Between the two of them, they encompass most of the usual uses of “go” (téigh is more of a general-use “go,” while imigh is more “go” as in “leave/depart”): “Go home,” “Go away,” “Let’s go to grandma’s,” “The road goes ever on,” “Does this bus go to Dublin?” “I go to work every day,” etc., etc. Neither of them, however, is used as a rallying cry. When you want to express something like this in Irish, you use the word abú, which means, roughly, “onward.” And it comes AFTER whatever you’re cheering for. The other issue with this “translation” is that, even if “Go Blue” could have been rendered using the verb téigh, the “translator” chose the wrong form of the verb. Dul is a form known as the “verbal noun,” which, depending on context, corresponds to the infinitive (“to go”) or the present participle (“going”). Ba mhaith liom dul abhaile: I would like to go home. Tá mé ag dul abhaile: I am going home. What was wanted is the imperative — the form of the verb that is used for giving an order or direction. In Irish, the root form of the verb is the singular imperative, so to tell one person or entity to “go,” you’d simply use téigh. For multiple people or entities, you’d use téigí. A sports team is a singular entity, so even if this could have been translated literally, the verb form should have been téigh, not dul. The point of this (and of other similar posts in this blog) isn’t to ridicule the University of Michigan or other groups/individuals who make these very public mistakes. It’s to emphasize the fact that, if you don’t speak a language, you can’t translate into it. You can’t even verify a translation given to you by someone else. That’s why you absolutely must verify your sources. Check, re-check, and then check again. Even if you get a translation from a close friend or family member, get it verified. Get a minimum of three RELIABLE sources in agreement before proceeding. Inflation affects the best of us…even translators. 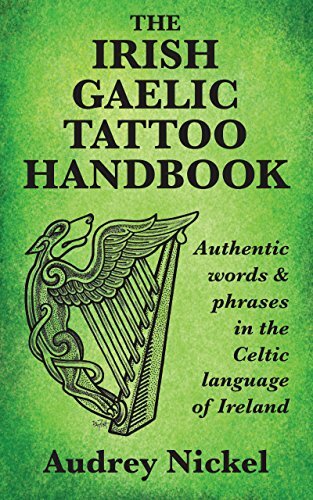 The price for both The Irish Gaelic Tattoo Handbook and The Scottish Gaelic Tattoo Handbook will be going up sometime this month. If you’ve been thinking about buying a copy of one or both of them, act now! Both books are available from Amazon and from Barnes & Noble, or from your local bookstore via special order. Author thegeekygaeilgeoirPosted on January 10, 2019 January 26, 2019 Categories Grammar, spelling, and other such learning experiences, Tattoo Translation Failures, Translation TrialsTags Dul Gorm, Gaeilge, Gaelic, Go Blue, Irish, Irish Language, Slogans, Sports, Translation, University of Michigan1 Comment on Oh, What an Idiom! Usually it isn’t too hard for me to figure out the intended meaning of a tattoo, no matter how mangled the Irish. This one, however, has me stumped. Usually, when I come across a badly mistranslated Irish tattoo, it isn’t too hard for me to figure out what the intended meaning was, no matter how mangled the Irish. This one, however, has me completely stumped. I’ve tried every way I know to work out what in the heck this guy meant to say, and I’m coming up blank. This tattoo was spotted on an episode of the television program “Penn & Teller: Fool Us” by Jessica Quinn, a member of the Facebook group “Irish For Beginners.” She was able to grab a shot of it and post it on the group page. By far and away the most common error people make when attempting to translate from one language to another is to assume that all languages follow the same basic grammar and syntactic rules as English. They’ll find an English-Irish dictionary, or perhaps do an internet search on the individual words they want to translate, and then put the results together as if they were English. That’s almost certainly what happened with the infamous “Gorm Chónaí Ábhar” debacle. These are usually pretty easy to spot, though. All you have to do is take the primary Irish meaning for each word and read it as if it were English. Inevitably some people take their translation requests to Google “Translate.” Bad move. Really bad. Google is notoriously bad at handling Irish. These can be a little harder to spot, as Google doesn’t always give the same output when translating Irish to English as it does when translating English to Irish. You can plug in the Irish and not get the English phrase or sentence that the searcher used. I wrote a little about that problem in this 2012 blog post for Bitesize Irish Gaelic: Irish Translators. If I had a quarter for every time I’ve heard someone say “I got this translation from a friend/family member in Ireland,” I’d be able to afford an entire summer in Donegal. Sometimes there’s no actual “friend or family member.” The person is just trying to cover up his or her own clumsy translation attempt. The person has no Irish at all, or maybe just a tiny bit. In this case the “Pretend It’s English” and the “Ask Google” methods come into play again. The person has some Irish, but is out of practice. When this happens, the translation will generally be much closer to correct, but with some mistakes. The person is messing with the tattoo seeker. When this happens we usually see something silly and rather mean-spirited, such as An bhfuil cead agam dul go dtí an leithreas? (“May I go to the toilet?”). This “translation” doesn’t seem to have resulted from any of these methods. (Personally, I wish he’d followed the “Buy Audrey’s Book” method. But I digress…). It’s possible the person’s primary language isn’t English, though usually when a person has more than one language, he or she knows better than to assume that all languages follow the same pattern. Unfortunately, because of this, none of my usual methods for working out what was meant are helping. The best I can do is point out the problems and make a guess. Let’s take a look at the elements that make up this tattoo and see what they mean (and what the problems are with them). Féidir is a word that, in the right context, can mean “possible,” “can/may,” or “maybe/possibly.” The problem is, it can’t stand on its own. Féidir is ALWAYS paired with the copula — a semi-verb that performs some of the functions of the verb “to be.” The forms of the copula are Is (positive), Ní (negative), and Ba/B’ (conditional). It’s also often paired with the preposition le (“with”). This is pretty straightforward. It means “death,” and is clearly intended to be the subject of the sentence (such as it may be). Typically in Irish the definite article is used with words that are presented as general concepts, so we’d expect to see an bás, but in the context of this total mess of a translation, it’s a reasonably minor issue. Well, the elephant in the room here is that this is two words jammed together as one. There is no Irish word “Nábac.” (No, not even in some obscure dialect in your great-great-great grandfather’s village in County Nowhere). This should be written as two words: Ná bac. Mise is the emphatic form of mé: “me/I.” In Irish, when we want to put emphasis on a word, we don’t stress it in speaking…we put it in an emphatic form. So, basically, what this says is ME!!!!!!! That’s the best I can do…maybe you can do better! Really, the only thing I can guarantee about this is that the Irish is shite. Feel free to post your suggestions, guesses, etc., in the comments. Most of the time, I feel a little bit sorry for people who make horrendous translation mistakes. This is not one of those times. OK…I have to say that, most of the time, I feel a little bit sorry for people who make horrendous translation mistakes. This is not one of those times. This pic came across my desk about nine months ago, and it may just be the worst example of a self-translation disaster I’ve ever seen. In fact, it’s so bad, and so out of context, that most of my Irish-speaking friends had no idea what this person was trying to say with those three Irish words: “Gorm Chónaí Ábhar.” It’s beyond gibberish. It even took me a few minutes. The sad thing is, in order to “get it,” you need to be familiar not only with the ways in which people make translation mistakes (which are legion), but also with a particularly unpleasant segment of U.S. politics. For the sake of those who don’t live in the U.S. (and without delving too deeply into the dark underbelly of American politics), suffice it to say that the slogan “Blue Lives Matter” arose in opposition to the “Black Lives Matter” movement. So no…I’m not very sorry for this person (I am, however, very sorry at the assault upon the Irish language!). That’s exactly what happened here, though. Someone either found a dictionary or searched the internet for the three words “blue,” “lives,” and “matter,” and stuck them together as if they were English. Oy. Dia sábháil (that’s Ulster Irish for “oy”). An idiom is an expression particular to a particular language or region. For example, in English, when we say that something “matters,” we mean that it has worth and/or that it makes a difference. It doesn’t necessarily work that way in other languages. In Irish, we’d have to get more specific. We might say something like Tá fiúntas i _____ (“There is worth/value in _____”) or Tá ________ tábhachtach (“______ is/are important”). To make matters worse, though (there’s another idiom for you! ), whoever made this “translation” apparently forgot that the word “matter” in English can have several meanings. In this case, the word he or she chose — ábhar — means “matter” as in “subject matter.” It’s a noun. Oops! Another thing this poor “translator” apparently forgot is that the word “lives” in English can be pronounced to rhyme with “gives” or with “hives,” and that the meaning changes accordingly. What was wanted here, of course, is “lives” as rhymes with “hives.” Three guesses as to which one the “translator” chose. Yep. Wrong one. To toss another problem onto the pile, in Irish, we probably wouldn’t use the equivalent of the English “life/lives (rhymes with ‘hives’)” to mean “people”. We’d most likely just use daoine: “people.” There’s that “idiom” problem again. The funny thing here is, the Irish word gorm actually does mean “blue” in most contexts. Just not in this manner, and definitely not in this context. When color is used to describe a person in Irish, it typically refers to hair color. For example An bhean rua: The red-haired woman. There are exceptions, of course: For example, Na fir bhuí (“The orange/yellow men”) is used to refer to members of the Orange Order because of the color of their sashes. But “blue/gorm” would not be used to refer to police officers as a group. That’s an American thing. All that having been said, though, here’s the lovely, delicious irony: When the word gorm is used in reference to people, guess what it means? People of African descent, or with similarly dark skin, are described as “blue” in Irish (most likely because dubh (“black”) and dorcha (“dark”) have negative connotations in the language and donn (“brown”) would be understood to refer to hair color). Somehow that makes me strangely happy.